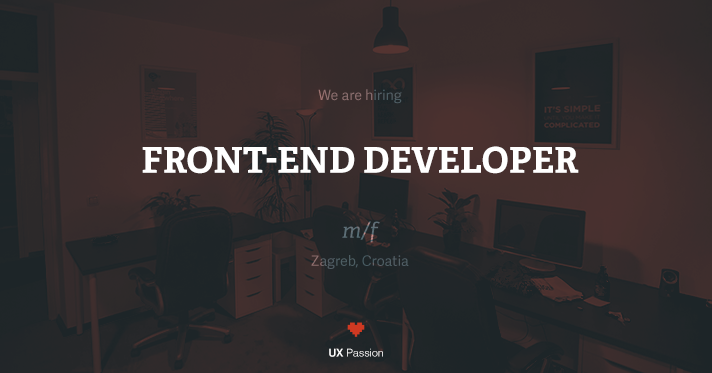 The UX Passion team is ready to grow yet again and this time we are looking for a front-end developer to join our team in Zagreb. Think you've got what it takes? Reach out to us and let's find out together! Good understanding of HTML and CSS is required. Bonus points if you have any experience with other JS frameworks, Node.js, Go, Python, and WordPress. You will act as a key expert for our new products, and that’s why we will prefer candidates who have an interest in software architecture and who are not afraid to contribute and exchange their ideas and be active members of product planning teams and processes. You will work with our most important clients, but your primary role will be the development of our products and services. We just recently launched Wallery, and we have some bold ideas for the future, so we hope you will help us shape it with your knowledge and personality. Our clients are located worldwide – literally on all continents, including Antarctica. We work with various clients like World Economic Forum, Microsoft, and IBM; but also with exciting startups and teams. We don’t divide clients into big and small ones; we decide to work with them based on their ideas and projects. We’ve learned to say no to projects that we didn’t think will bring us enough challenges and excitement. We believe in a business model where we don’t rely exclusively on the client and services work, but rather we develop our products and services for global markets. This way, we get to learn from both worlds – one being the agency and client work and the other being the product development with a flair of startup culture and mindset. We have flat, project-based teams with little to none administrative burden. Your future colleagues are smart, passionate and driven individuals. They hail from different backgrounds and bring their uniqueness to our team. We offer all the usual perks you’d expect and then some. You will pe paid based on your experience and knowledge. While the possibility for remote work is not excluded, for this particular role and because of its importance for our team, we will give the advantage to people who can come and work from our beautiful and cozy office located in Zagreb. If you have pets, you are more than welcomed to bring them to the office if you’d like to do so! Send us your CV and email saying why would you like to work with UX Passion and our team will then invite the best candidates for an interview. You will be interviewed by your peers – other developers in the team and our CEO. We will be expecting your emails at [email protected]. P.S. If you have any personal or hobby projects dealing with AI, ML or IoT, that’s a big plus. Also, having an active GitHub account helps! Bring Mockups to Life with Real Content! GOAP in Zagreb – or What the F*** was That?